I never realized I was such a slacker next to President Bush. 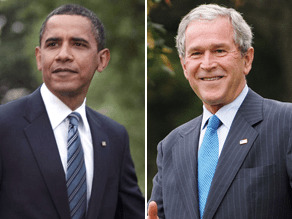 I was sent an article comparing the reading habits of Presidents Obama and Bush. Bush, it appears, had an ongoing competition with Karl Rove to see who could read the most and reportedly read nearly 2 per week (95 in 2006) during parts of his presidency. In April, Obama stated he is reading Joseph O’Neill’s novel “Netherland” and repeated it in a recent BBC interview, putting him at a pace of only 10 books per year. While this isn’t a very accurate measurement of Obama’s commitment to reading–and I think we’d all rather him be leading our country!–I realized that I’m not doing much better. So, I committed to reading 1 book per week over the next year. I’m using my Book Log to help me track myprogress. Anyone else up for the challenge? Despite the fact that the US spends nearly twice as much on healthcare as any other country, the US is as much as 12 years behind other OECD countries in health information technology investment. 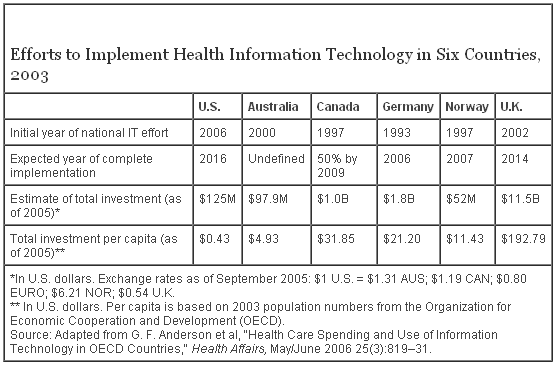 See the Commonwealth Fund’s entry on Health Care Spending and Use of Information Technology in OECD Countries. The American Recovery & Reinvestment Act of 2009–the Stimulus Package–apportions $19 billion for investment into the HIT infrastructure in the US. As much as $3 billion goes to the Office of the National Coordinator (which will now be codified) and other standards creating bodies. The remaining amount will be given to providers primarily through increased Medicare reimbursement. If divided evenly, each hospital would receive approximately $11 million. A substantial sum, but hardly close to the $200 million over 3 years required in a typical implementation at a 300+ bed hospital. Only 10% of hospitals currently have full electronic health records. Another 20-30% are in planning or implementation stages. The stimulus may encourage more providers to enter the planning stages and will help along those already in the process during difficult economic times. But $11 million for the remaining 60-70% is entirely insufficient. Evidence shows that the only providers that stand to get a return on investment in HIT are large network providers with geographically distributed practices, such as Kaiser or the VA. This makes sense, as the administrative cost of sharing information is high. The early adopters (the 10%) consist of these large networks and a few providers with well-funded, forward-thinking CIOs. The 20-30% currently planning hope to break even at best and justify the investment by improved patient care (especially through CPOE). The rest are mostly too small to realize significant cost savings and will likely need much more than $11 million to break even. This evening, my thoughts return to the first night I addressed you from this house — September the 11th, 2001. Afghanistan has gone from a nation where the Taliban harbored al-Qaida and stoned women in the streets to a young democracy that is fighting terror and encouraging girls to go to school. Iraq has gone from a brutal dictatorship and a sworn enemy of America to an Arab democracy at the heart of the Middle East and a friend of the United States. There is legitimate debate about many of these decisions. But there can be little debate about the results. America has gone more than seven years without another terrorist attack on our soil. I’ve often spoken to you about good and evil, and this has made some uncomfortable. But good and evil are present in this world, and between the two of them there can be no compromise. Murdering the innocent to advance an ideology is wrong every time, everywhere. Freeing people from oppression and despair is eternally right. This nation must continue to speak out for justice and truth. We must always be willing to act in their defense — and to advance the cause of peace. 9/11 laid such a heavy burden on this administration that Bush only gives a single paragraph to the other major events of his administration: expansion of Medicare prescription drug benefits, No Child Left Behind (which he doesn’t mention by name), lower taxes, promotion of faith-based programs, and providing assistance to persons living with HIV/AIDS. Let’s spend a minute on that last one. The President’s Emergency Plan for AIDS Relief (PEPFAR) is largely considered to be the most successful international aid program the US has enacted and recieves strong bipartisan support. PEPFAR provided $50 billion over 5 years to fund anti-retrovirals and contraceptive distribution networks, as well as educational programs (usually abstinence based, although this is changing). PEPFAR has had a slew of problems, but is still one of the largest sources of funding for AIDS relief. Yet, President Bush hardly even mentions it. But more than anything, I am struck by the divisiveness of his language. President Bush entered office vowing to be a “uniter not a divider”, yet he left with extremely low approval ratings and negative perceptions of the US worldwide. Drawing sharp lines between black and white, good and evil, may be useful to him in his personal life, but divisions such as these can have harmful and polarizing effects in politics. Unity is not achieved by publicly labeling outsiders. If a group identifies themselves by their opposition to you, calling them evil strengthens their identity and opens you up to scrutiny (consider Bush and the torture at Guantanamo). While discussing this issue with a friend of mine, he said something quite insightful: “Great men in history have created divisiveness and offense without exception. They simply know that their ultimate goals are more important than public acceptance…Great men may create terrible controversy, but at least they have the appropriate methodology and results to back it up.” Therefore, division isn’t the problem, it creating division without support, without evidence, without proper methodology. Politics is labeled the art of compromise for a reason. Political philosopher Jean Bethke Elshtain states: “But compromise is not a mediocre way to do politics; it is an adventure, the only way to do democratic politics.” Certainly, this argument is a simplification, but I look forward to the departure of divisive ideology from the White House. Tonight, we proved once more that the true strength of our nation comes not from the might of our arms or the scale of our wealth, but from the enduring power of our ideals: democracy, liberty, opportunity and unyielding hope. This is our time — to put our people back to work and open doors of opportunity for our kids; to restore prosperity and promote the cause of peace; to reclaim the American Dream and reaffirm that fundamental truth that out of many, we are one; that while we breathe, we hope, and where we are met with cynicism, and doubt, and those who tell us that we can’t, we will respond with that timeless creed that sums up the spirit of a people: Yes, we can. China’s President Hu Jintao called this “a new period of history”. The Times of London said Obama had revitalized U.S. politics. “The immense turnout in yesterday’s election was testament to the energy, excitement and expectations of a rejuvenated American democracy, as well as the fears of a nation standing at a crossroads of history,” the paper said. To celebrate this momentous election, Kenya even declared November 5 a national holiday!